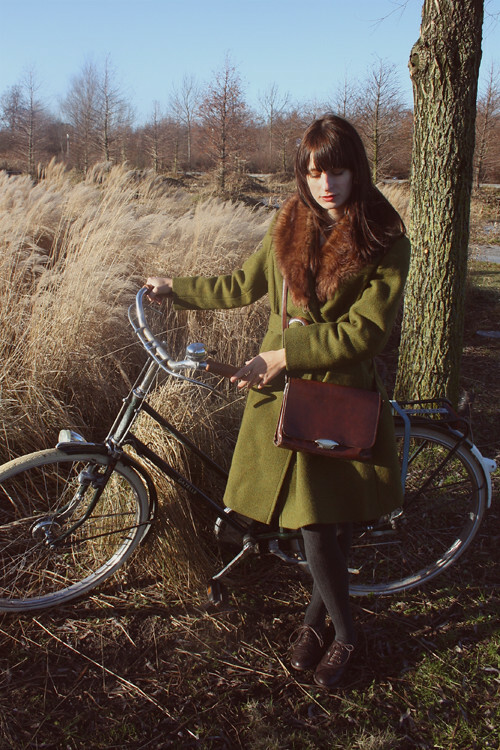 Vintage coat, bike and bag / Modcloth dress / Zara cardigan. Oh oh oh, I'm so busy with all my schoolwork. Of course I procrastinated all my assignments to the very very last moment, and on top of that I have 3 exams next week! So sorry if I'm not replying to many comments or emails! After next week I'll have a couple of weeks off so I'll be back to surfing the blogosphere all day, every day. Like your vintage style ! That white dress is so romantic. You look lovely. I love your coat, and I love your dress! It's so pretty. Good luck on your school work! Love it! Echt super mooi weer! I'm loving the World War 2-esqe look! I suits you no end! Congratulations on your blog doing so well, you deserve it all! I love that cardigan from zara. I wasn't able to buy it though :(. as always you're amazing! love ur sytle! I love your coat, it's beautiful!! Great bag too. Geweldig, ik vind je jas met bontje super! that green coat is gorgeous on you! 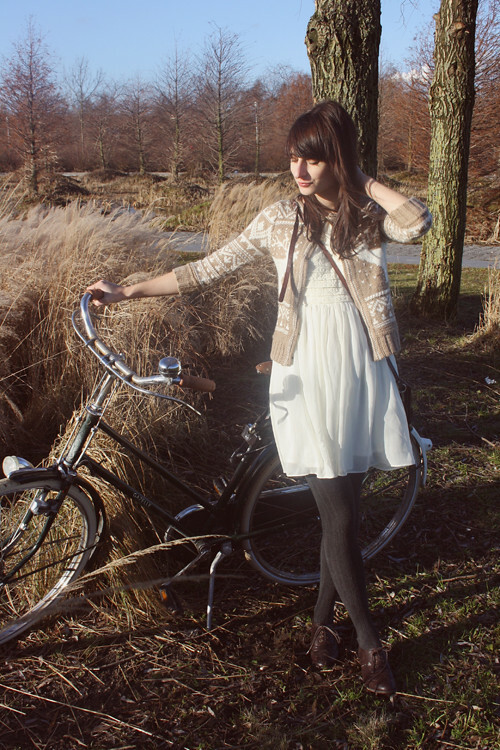 I really like the idea of the sweet dress and the bike! love the olive colour of that coat so much, its beautiful! 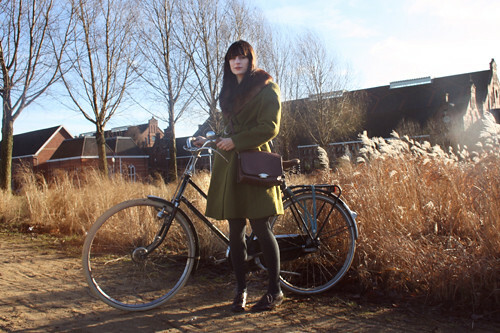 your coat and bike are both a dream, Laura! And the reason for all your success is b/c your style is TOP NOTCH. Really, it is. And you totally deserve all of those features, your blog is amazing!! Thank you for commenting because it led me to your blog even sooner!! Your pics are gorgeous and I love your outfits. That bike is AWESOME! Congrats on the MTV page! These are such stunning pictures. THe bicycle is a beautiful prop. And congrats on how much your blog has grown! that's so amazing. That coat is just superb! I really love it so much! i really like the color of the coat! You deserve it, i love your blog!